Cleaning, disinfecting and sanitizing. These three terms are often used interchangeably, but this practice is incorrect. Each has a very specific meaning and if used wrong, building service contractors could jeopardize a contract with a customer, not to mention the health and safety of building occupants. Cleaning definitely is not the same as sanitizing or disinfecting, according to industry consultant Darrel Hicks. Cleaning is the removal of all foreign material from high-touch objects (HTOs) and surfaces by using water and detergents, soaps, enzymes and the mechanical action of washing or scrubbing the object. For some industries, killing a vast majority of germs is adequate, and necessary within a short period of time. Other industries require all organisms to be killed but can wait longer in order to ensure it. This is one of the differences between sanitizing and disinfecting. Disinfecting, normally used in a healthcare setting, kills germs at the rate of 99.999 percent of viable pathogens on a surface or HTO within 10 minutes of dwell time; that is, the amount of time the chemical must remain on a surface to be effective using the Environmental Protection Agency’s Use Dilution Test. This process does not necessarily clean dirty surfaces or remove germs, but by killing germs on a surface after cleaning, it can further lower the risk of spreading infection, according to the Centers for Disease Control (CDC). Hicks points out that hospitals typically use disinfectants on areas that have come into contact with blood or other body fluids. Disinfecting also is a normal requirement in critical-care areas of healthcare facilities when there is a known outbreak of communicable disease and is part of the cleaning process when blood or other potentially infectious material is present in the facility. “Factors that affect the efficacy of disinfection include prior cleaning of the object or surface, soil load present, the type and level of microbial contamination, concentration of and exposure time to the germicide being used, physical nature of the object — does it have crevices or hinges or the presence of biofilm [a slimy substance that forms on a surface exposed to bacteria and water],” says Hicks. Sanitizers reduce 99.9 percent of microorganisms in 30 seconds during a public health test known as the Official Detergent Sanitizer Test. 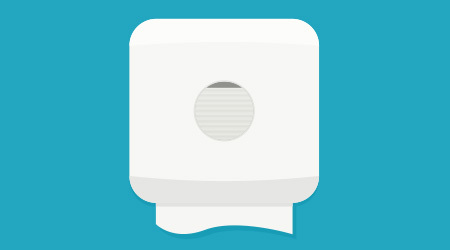 “Sanitizing is accomplished by using either heat, radiation or chemicals. 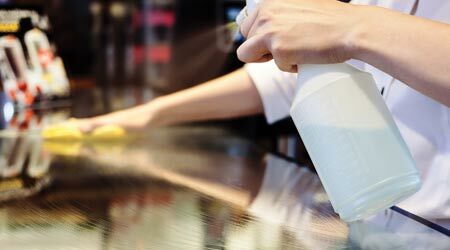 Unless the item to be sanitized is effectively cleaned, it is impossible to obtain close contact between the sanitizer and the surface to the sanitized,” says Hicks. Sanitizing is used mostly in foodservice facilities to make sure pathogens are down to a safe level before preparing food on a surface. Sanitizers require much shorter dwell times than disinfectants.